A new day is dawning when the Internet will be reclaimed by those who manifest excellence in their work and the love of God in their relationships. 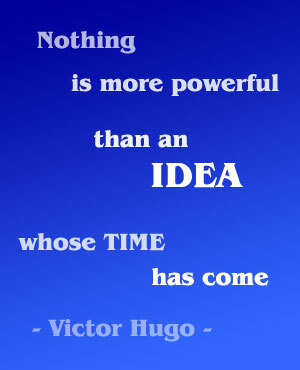 How are you going to share your UNCOMMON message with the world? I’ve said over and over again that the Internet is God’s supernatural highway of communication. Today’s story is a testimony of how God is using the web to open doors to new nations for me. In January 2008, Jerry Graham referred me to Robert Hartzell, founder of Fountains of Life. While Robert already had a website, he recognized it needed a major upgrade. Robert also wanted to integrate email marketing into his website and to begin a web store. Robert said the main thing that attracted him to me is my gifting to POWER network God’s army. Robert has done an amazing job growing in his use of the web. It’s incredible how quickly he grasped the concepts and ran with them. After I set Robert up with a blog, he began posting entries using his monthly newsletters from the past 10 years. That moved Fountains of Life into the top 10 with Google for several keyword searches that were important for people to find Robert and his ministry. While Robert lives in Florida and I have never met him in person, he has turned out to be a tremendous blessing to me, helping me grow in several areas of my life. In addition, he is now connecting me to other prominent Christian leaders. Over time, we have developed a covenant relationship. On March 4, 2008, I hosted my very first “Uncommon Internet Marketing Seminar.” That was followed up with two more, March 19 and April 1. I have seen fruit almost immediately from each of those. Before my webinar on April 1, I did minimal advertising. One thing I did do was ask Robert to use his new email marketing system to invite his contacts. One of the people who responded to Robert’s bulk email was Steve Cobb. “I want to thank you for your helpful webinar and Robert Hartzell for inviting me. I’m the President and National Director of the Institute of Theology by Extension in Guatemala (www.inste.org). At the end of your seminar you described 4 characteristics of people you like to relate with and I identified with all four (depending on how much of a financial investment it would mean). I liked very much the point about life-time clients and I have a few of them, and would like very much to get closer and more personal with them, as well as add new ones. Most gracious and merciful Father, thank You for connecting me to awesome leaders like Jerry Graham, Ben Stewart, Robert Hartzell, and Steve Cobb in the past year. Bless each of them, their families, and their ministries. Thank You for Your promise in Luke 6:38, “Give, and it will be given to you: good measure, pressed down, shaken together, and running over will be put into your bosom. For with the same measure that you use, it will be measured back to you.” We bless and honor You Father, Son, and Holy Spirit. In Jesus name, Amen and Hallelujah! 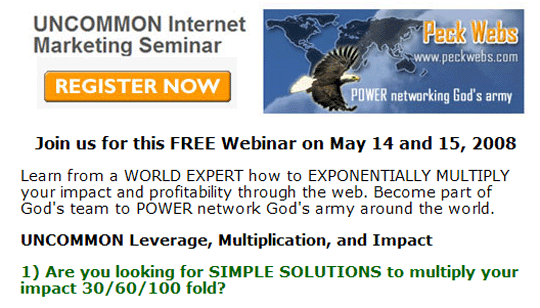 I am hosting two more UNCOMMON Internet Market Seminars on May 14, 2008 from 2-3 pm and on May 15, 2008 from 8-9 pm. To register, CLICK HERE [visit https://www.webinars777.com/register.php?webinar_id=0000021]. Bless a few friends by inviting them! You’ll be paid a 10% referral fee for each one who becomes a web client of mine. Blessing to learn to use the web effectively to share your UNCOMMON message with the world!